First snow of winter does not delay Tuesday morning gathering where new facility will soon be built. A little snow didn't keep city, county, business and social service leaders from celebrating the upcoming construction of a new homeless shelter and navigation center early Tuesday. Mayor Ted Wheeler and Columbia Sportswear President and CEO Tim Boyle were among those who gathered on Portland-owned property near the Old Town/Chinatown neighborhood on the morning Feb. 5. They were there to celebrate the pending construction of the new facility funded largely by Boyle with a commitment from the Joint Office of Homeless Services to pay the operating costs. 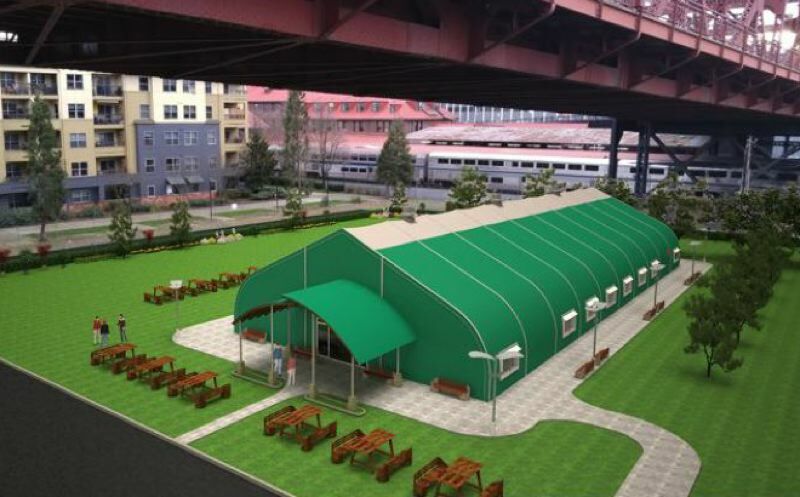 The shelter and center is planned by the Oregon Harbor of Hope, a nonprofit organization co-founded by developer Homer Williams and economic development consultant Don Mazziotti. "This is a major accomplishment for the community and I want to urge the private sector to continue to step forward in supporting the work of Oregon Harbor of Hope and public/private partnership to help the homeless," said Boyle. "The Navigation Center approach has been proven to work, offering not just shelter but essential support services," said Williams. "We are grateful for all the talented, committed people and the Joint Office for Homelessness who have come together to make this happen." • Center open 24/7/365. Guests will be allowed to stay while they prepare themselves to move into permanent housing. "Harbor of Hope shows what is possible when the private sector joins with our non-profit organizations and the city to make real progress in the fight against homelessness," said Mayor Wheeler. Multnomah County Chair Deborah Kafoury was also scheduled to attend. Construction will begin when all city permits are secured, and the soil remediation plan has been completed. Remediation is expected to begin in the next two weeks, and the facility could open as early as June. Remediation and construction costs are estimated at $3.5 million. Boyle and his wife Mary have donated $1.5 million and pledged another $1.5 million, and others have contributed the rest. Operating costs are estimated at $900,000 a year. Developer Jim Winkler is challenging the soil remediation plan at the Oregon Court of Appeals. No schedule has been announced for the suit.